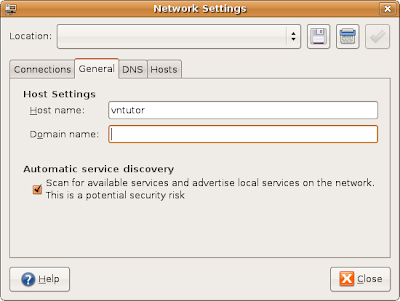 Basically the network interfaces have been configured already during installation of Ubuntu Linux. However, if you are a new Ubuntu user, you should know a little bit about how to add or remove network devices on your Ubuntu box. This post is also useful for anyone who has a troubleshooting with network connection. You will go to a "Network Setting" panel as the following screen. At the default mode, the first tab (Connections) is selected. This tab allows you to setup all network connections. In this case, I have two different network cards. 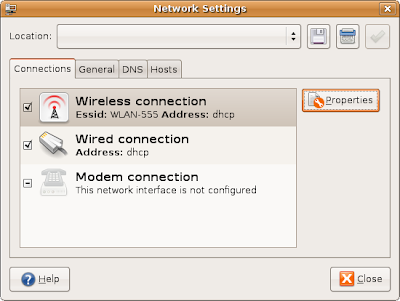 Both of wired and wireless network interfaces are currently configured for using DHCP address. Dynamic Host Configuration Protocol (DHCP) is a protocol used by networked client computers to obtain IP addresses and other parameters from a DHCP server. Now, I try to click on the second option "Wired Connection" and hit "Properties" button. 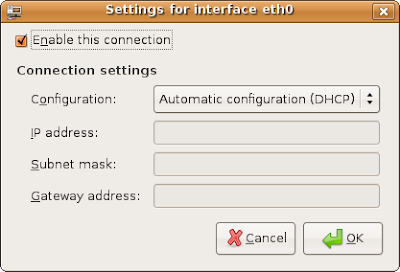 Here, I can see that the check box has been sticked to mean that "This connection has been configured" for interface eth0. From the drop-down list of configuration field in "Connection Setting" part I can identify what kind of IP address should be used for this connection (a static IP or a dynamic IP). For the first option in "Network Setting" Panel is checked when we want to use a wireless connection. You have to make sure that your computer support for a wireless card to configure for this connection. The following screen shows that you have configured for your wireless network device as the interface eth1. 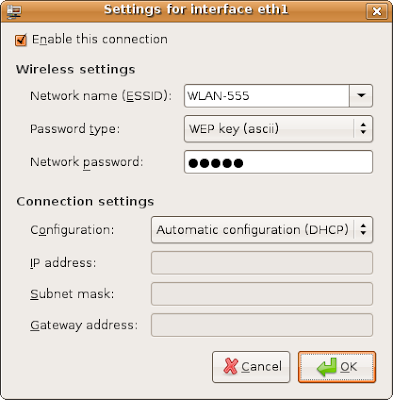 This interface will be connected to a network named WLAN-555 with two parameters about password for network authorization. 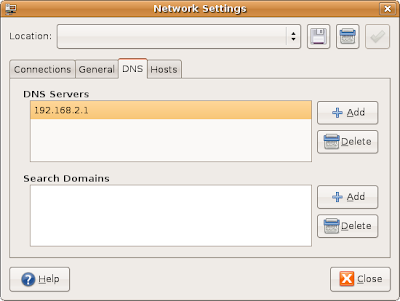 We continue with the second tab (General) in the "Network Setting". This part allows you to put a name and domain for your host as shown in the following picture. The third tab can be used to identify a Domain Name System (DNS) which translates hostnames to IP addresses. This is needed for network devices in delivering information. Just click "Add" button and enter a new IP address of your DNS server and click "Delete" to remove an existing address from the available list. The remanding tab let you create aliases for local IP address on your computer. Look at some examples in the following pictures. Hopefully, it is useful for you. Thank you for your reading. I installed XP on my macbook with bootcamp. Everything worked great, i had my wireless and my network cable via ADSL. Once i installed Vmware Fusion and setup the XP with it, the network connections window shows only one setting. I don't have a wireless connection. I checked the driver and it shows VMware accelerated AMd PCNet Adapter. The Macbook is only connected online via wireless, yet XP and Ubuntu both now only show a wired connection thru Fusion. I've tried everthing. In Control Panel>Device Manager, i select network adapter>view>show hidden devices, it shows the other adapters, atheros 5008 wireless, etc. But i cannot get XP or Ubuntu to show the wireless connection. very frustrating... as i'm using wireless, but its showing a network cable connection in the settings.